"We don't have much time!" 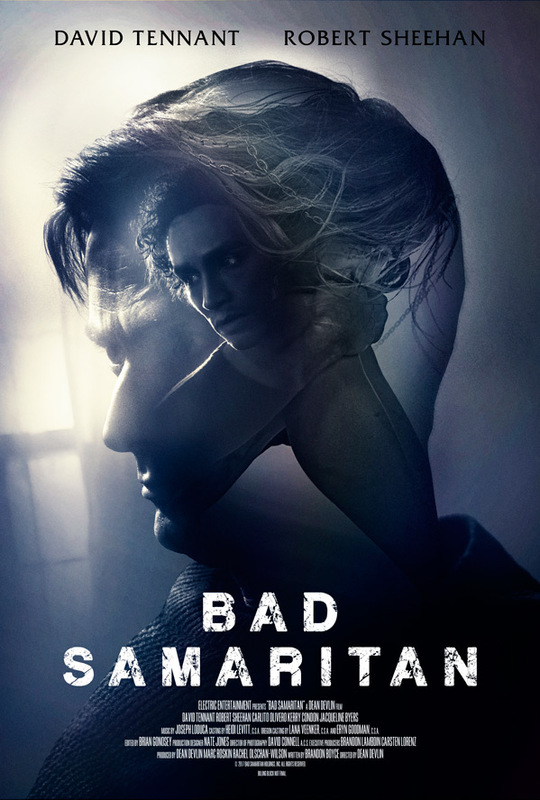 Electric Entertainment has unveiled the first official trailer for an indie action horror thriller titled Bad Samaritan, the latest film directed by producer/writer Dean Devlin. The film is about a pair of clever young thieves who rob the houses of rich people, but one day one of them winds up at a home where a woman is being held against her will. When he tries to call it in, the police find nothing, and he ends up in the sights of the kidnapper while trying to figure out how to save her. Robert Sheehan stars, along with David Tennant, Carlito Olivero, Kerry Condon, Lisa Brenner, Hannah Barefoot, and Jacqueline Byers. This looks fairly creepy, with Tennant giving a good subdued evil performance. I'm actually interested in seeing this, a slick psychological thriller about a lunatic almost like American Psycho. A valet (Robert Sheehan) develops a clever scam to burglarize the houses of rich customers. Things go smoothly until he robs the wrong customer (David Tennant), and discovers  a woman being held captive in his home. Afraid of going to prison, he leaves the woman there and makes a call to the police, who find nothing when they investigate. Now, the valet must endure the wrath of the kidnapper who seeks revenge on him, all while desperately trying to find and rescue the captive woman he left behind. Bad Samaritan is directed by veteran producer/writer (of the scripts for Universal Soldier, Stargate, Independence Day, Godzilla, "The Outpost") and now filmmaker Dean Devlin, making his second feature film after directing Geostorm previously. The screenplay is written by Brandon Boyce. Electric Entertainment will release Dean Devlin's Bad Samaritan in select theaters starting March 30th next month. How does this look? Who's in?